7 Free AEPA Study Guide Tips…That Actually Help You Pass! Look at the AEPA study guide information at the official website. Preparing to take your Arizona teaching exams is easy, right? The Arizona Educator Proficiency Assessments study guides at www.aepa.nesinc tell you to just look at the framework for the tests, answer a few AEPA practice test questions, and then sort out the textbooks and notes from your college courses to study. You read this correctly: just sort out your texts and notes. From all of your courses. It’s possible that you have the time to do this. It is also possible that you have all of your texts and notes organized. It’s even possible that you took excellent notes and did not fill your notebooks with pages of extra details. Just like 99.9% of the students in my Arizona teacher education courses, after my class completed, I didn’t need my textbooks nor kept dozens of old textbooks for a personal library. Since I purchased my college textbooks from the university bookstore at 500% mark-up, I couldn’t afford to hold onto them for future reference. I sold them back when the class was done, so I could afford to buy books for the next semester. It’s likely if you do have any “old college course notes” around, it’s full or recording education instructions rants that almost never covered the material required to answer real AEPA test questions correctly. So not sure what planet or reality those AEPA study tips are coming from. Between classes, work and family, and the urgency to get on with your career in education, trying to locate and study the right information is like facing a mountain that you just can’t climb. Is it any surprise that after 1-4 weeks of AEPA test prep the vast majority of Arizona teacher candidates feel overwhelmed, stressed, and frustrated? What if you used your AEPA study time to figure out which test material you DO know and which material you DO NOT know? Then you could focus review time on what you DON’T know to pass the AEPA test. That’s not as easy as it may seem. In a 2007 report, the IES (Institute of Education Sciences) found that “without training, most learners cannot accurately judge what they do and don’t know, and typically overestimate how well they have mastered material when they are finished studying” (https://ies.ed.gov/ncee/wwc /Docs/ PracticeGuide/20072004.pdf). This is called the “illusion of knowing.” Maybe you recognize it if you already have a AEPA study guide and tried using it. Have you ever been surprised by a low grade on an exam in your college classes because you spent hours studying and thought you knew all the material? Talk to others who have taken the AEPA. Many of us suffer from the illusion that we know the information. . .until we see our scores 2-4 weeks after the exam and wonder what happened! How Do I “Know What I Don’t Know” To Prepare For My AEPA Test? This “illusion of knowing” has been studied extensively. The National Center for Education Research says there are ways to overcome it. Teachers can use techniques to help students improve their ability to judge whether they know information after they study it. That’s great news for you! You can pass these AEPA test study guide techniques on to your future students! 2. Your AEPA book shouldn’t provide the correct answers on the same page as the practice questions. If they do cover the answers up while answering sample questions. Using the answer key while taking sample tests is a crutch. It won’t help you improve your ability to take the exam and/or answer questions correctly. If most of your test practice consists of reading the sample test question and seeing what the correct answer is, you’re performance taking genuine AEPA questions will suffer. The moment you notice your real test questions aren’t the same as the practice questions in your AEPA book, it’s all over. 3. Finally, don’t just answer the question on your study guide for the AEPA. Instead, answer it. Then, ask yourself, “Would I get this answer right if it were on the test?” Use a 1-10 scale to show you how confident you feel about the right answer. Be honest. If you’re honest, this is how you will know where to focus your prep time. Studies done with students of different ages—including college students—proves this works. If you follow the three steps, you can better gauge whether you really do know the information or whether you just have the “illusion of knowing”. Know The AEPA Material, Know The Test? If I fail, I don’t think I can face my family and friends. Arizona Educator Proficiency Assessments (AEPA) consists of 100-150 multiple choice questions. The correct answer lies right in front of you as you take the timed test. Since you have studied the material using a AEPA prep book specifically created for the current Arizona Educator Proficiency Assessments, you should pass. Well, maybe not. The problem? It’s a timed test. The questions are difficult and lengthy. Many answers are lengthy, too, and all of them seem correct! If this Arizona teacher certification exam were easy, everyone would pass it the first time. To pass it the first time, you need to have a AEPA test prep tool that also teaches you what you do NOT know about taking the test itself! 1. Does the information in the AEPA book match the framework for my test? Check this at www.aepa.nesinc website under “Prepare.” It’ll give the percentages of questions and the content areas you will find on each test. 2. Is the AEPA book’s content knowledge current? When was the study guide written? Check for signs that the manual includes updated material. Don’t just look at the copyright which can be misleading! 3. Does the AEPA study guide explain each practice question AND answer? Do you learn why each answer is correct AND why answers are incorrect for each particular question? Does the AEPA review manual explain test phrases and key words used in questions and answers? 4. Does the book include a section on test-taking that gives more than just a list of tips? Does the information seem like something you can actually do? 5. Does the Arizona Educator Proficiency Assessments study guide explain how to overcome your fear of timed tests? Does it explain how to pace yourself during the test? to boost the productivity in the use of test prep books for adult standardized tests. They published a meta-analysis of 118 articles that researched various test prep methods for adult certification and licensing exams and its affect on real test scores. One major finding was that test takers who studied in short study sessions, for example, 20-40 minutes blocks of time with short 5-10 minute breaks in between had between 7%-23% improvement in test answer recall. Doing this allows your long-term memory to store information more efficiently and effectively…Something you require if you expect to pass-the-AEPA. 1.) Study for the AEPA in short, focused bursts of uninterrupted time. That’s why a more mindless, random style of studying without any study techniques usually result in failing this exam. *Start using short, highly focused 20-40 minute AEPA test prep sessions as you go through sections of your review materials. Then take 5-10 minute breaks in between. Don’t cram hour upon hour. If you do you’re wasting time. *The mistake many AEPA test takers make with this technique is that they study in short sessions and take the breaks, but are constantly interrupted by other people, text messages, social media updates or email alerts. *Do NOT check your phone, email or social media during these short, focused review sessions. If you do, you’ll greatly diminish the effectiveness of this scientifically proven technique. 2.) If you’re really serious about maximizing the productivity of your AEPA preparation materials, then turn off your phone, email and other alerts. Tell possible interrupters what you’re trying to accomplish and why it’s important for you to have focused, uninterrupted blocks of time to prepare. This way they can support you and reduce distractions that can jeopardize your long-term goals. 4.) Be sure to give your brain a well deserved and needed break between AEPA practice sessions. Any activity you do during these short breaks must be relaxing and rest your brain. For example, you could listen to music, take a 10 minute power nap or have a light meal or snack. Do not do mentally taxing activities during your breaks. Beware: It’s easy to sidetracked into some other activity during these short breaks and then find yourself 30 minutes later trying to get back to the studying you should be doing. 5.) 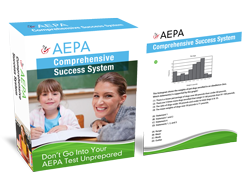 When using your AEPA study guides read and record all the words, phrases, or types of questions confuse you in your book so the language of the test and common vocabulary related to the subject of your exam isn’t a barrier to passing during the actual test. 6.) “Knowing what you don’t know” is important when it comes to AEPA review strategies. The same people who take a AEPA prep course or read an article like this say, “Oh yeah, I heard that test prep tip or method before” are the same people who aren’t using it. Those Arizona teacher candidates who fail this exam and postpone their teaching career are the same people who “heard all this before” and already “know everything.” Remember, just “knowing about” a study strategy won’t do anything to help you get a passing-score. You actually have to use it over and over again to get the same results as those who pass the AEPA exam. 7.) Get multiple AEPA study resources and prep materials if you want to pass. When I studied for the AEPA exam, I was tempted to see how little I could invest in myself, future and still pass. Then I remembered I just spent over $27,000 to get through college (or student loans I must start paying back). Therefore, a lot if riding on whether I pass and start teaching or not. Trying to pass a teacher certification exam that’ll launch a career that pays $30,000-$70,000 (or over one million dollars during my working life-time) with a $21 book is a ridiculous and naive thought. What I found in getting several AEPA test prep guides what that while each overlapped, each also had unique content. When I took the real AEPA test, I discovered different books I purchased helped answer different questions on the exam. Just the few extra points I was able to gobble-up (that helped me pass) was from practice questions and content I encountered across all my AEPA exam study guides. See more free AEPA study guide tips online at the link below. Go to: Discover What You “Do NOT Know” In Order To Pass-The-AEPA Now.